Historic Royal Palaces’ Collections Management team regularly holds an ‘Object of the Month’ competition to share the stories of some of the hidden gems within our collection. This ivory silk satin waistcoat came top recently. 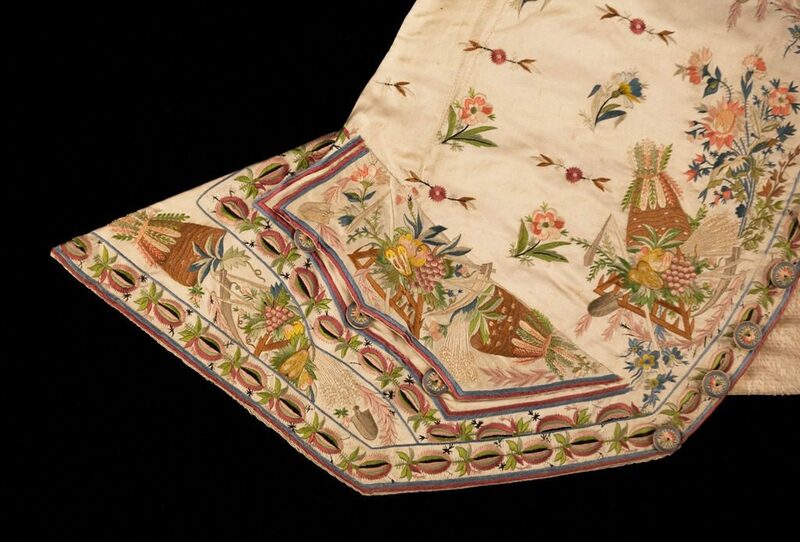 Part of a court suit from around 1790, it is beautifully embroidered with a floral design. In addition, Trophies of the Harvest can be seen delicately embroidered on the edges. The waistcoat reflects true harvest fashion with embroidered produce drawn from crops that come to maturity around the time of the Harvest Festival, such as corn which you can see charmingly embroidered on the edges. Harvest is from the Old English word haerfest, for autumn, but is a worldwide celebration. Given the differences in climate and the crops used around the world, harvest festivals can happen at different times of the year but they all give thanks to the harvest of the crops. In Britain, harvest festivals have been happening since Pagan times, and are traditionally held on the Sunday nearest to the Harvest Moon. This waistcoat (3500820) is part of the Royal Ceremonial Dress Collection, a Designated Collection. This Designation Scheme identifies and celebrates outstanding collections, which deepen our understanding of the world and what it means to be human. Since 1997 the Designation Scheme has identified the best collections held in museums, libraries and archives across England. The founding aims were to raise the profile of these vital collections and encourage everyone to safeguard them.